Searching through Search Box in your blog/website is the most important aspect. It might happens that one must be blogging since last 4-5 years and might had wrote about 500-600 posts OR same case might had happened with any website also. The website may contain about 50-100 webpages. So user may get confused without the "SEARCH BOX". Consider any shopping website in your mind and think if search box is not available. How Ridiculous it would be ! So, users/visitors won't be able to see all the posts/webpages and user might get irritated by clicking on NEXT or PREVIOUS button. 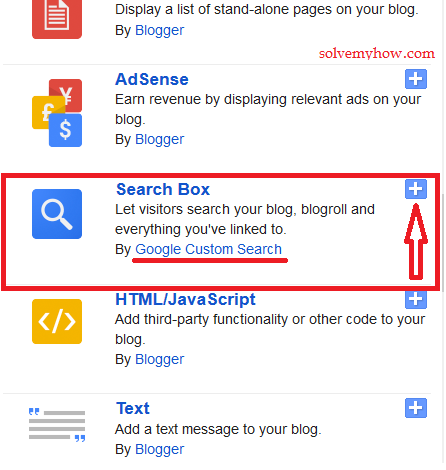 Now, if you wanted to have Sitelinks Search Box in Google Search Results then also you need to add Custom Search Engine in your Blog/Website. So, I would say every blog/website must have the "Search Box". You might have observed SolveMyHow. We've our own Search Box ! To Create your own Search Box for Website/Blog you need to write Java Script Code. But Blogger's doesn't need to worry about this ! 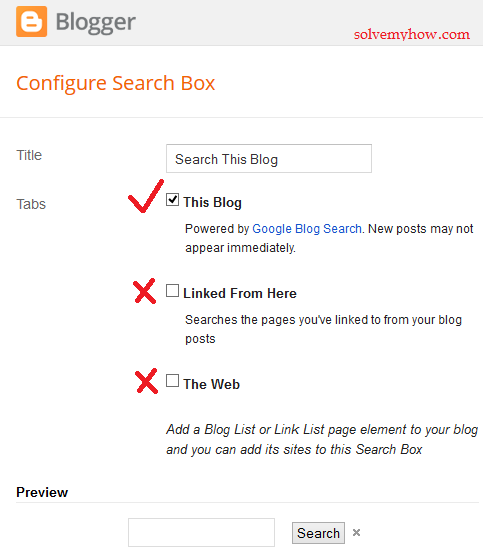 How to Add Custom Search Engine in your Blog ? If you're a blogger the Google has resolved this problem for you. They've provided the default Search Box in Gadgets. Step 1:- Go to Layout >> Add a Gadget ! Step 2 :- Look for Search Box and click on "+" to add it ! Step 3 :- Configure Search Box ! Here you've set the "Title Name" and "Tabs". Just set the values and Click on Save. Recommended :- Tick mark "This Blog" only and Un-Tick the rest. This Blog :- It search's only your blog. Linked From Here :- It also Search's links you provided in your post's. The Web :- It'll also give the web search results. Do you have the Search Box on your Blog/Website OR What benefits you're getting after adding it ? Don't forget to share it via comments !